As an occasional painter, and someone who recently dusted the cobwebs of his oil paints and brushes after what seemed like an eternity, it occurred to me recently that not only is life itself a work of art, but the people in it are also living, breathing Picassos’. Literally everything on the universal canvas that we call life is an intricate work of art; created to perfection by the cosmic artist. It is with this thought in mind that I will share a story with you from my recent past. In the last six years I have on occasion worked with adults and young people with learning disabilities on a part-time basis. Now, people in general have an annoying habit of looking at someone else and forming a judgement based on what they can see; and I believe that to an extent we are all guilty of this. Also, if you were to hang a painting on a wall and ask a cross-section of people what it represented to them it is highly likely that you would get many different interpretations of the same painting. What this shows is that we all view things from our own perspective, and this includes life in general. It is quite uncanny in this day and age that some people still look on those with learning disabilities as “mad”. I, however, have a completely different view. I actually had two stints of employment in one establishment where I worked, and the little story I want to share concerns an incident that took place at the beginning of my final shift at the end of my first stint. I turned up at the required time in the unit where I was due to work, and on finding that the day staff had already gone home, I thought it best to nip downstairs to the office to see if there was any messages for me. I had a quick scan of the kitchen but did not see the keys. What happened next was quite amazing. The kitchen was entered via the lounge, and diagonally and to the right of that door, was another door leading out of the kitchen to a corridor where some of the residents had their rooms. The distance between the two doors was minimal; no more than a metre and a half. In the split second that the thought “I wonder where the keys are” entered my head, one of the residents (I will call him Paul) entered the kitchen en route to his room. Now Paul was a very pleasant and boyish man in his 40’s. Indeed there was something very child-like about him. However, if he did not know you well he was not a good communicator, and given the fact that I was only employed part-time and on a “bank” basis, I had only ever had minimal contact with him. It would be true to say that Paul and I had never had a conversation and that he had never actually spoken to me properly before. So I was astounded when in the very moment that the thought entered my head, Paul walked through the kitchen, paused momentarily, pointed to the worktop and in a voice as crystal clear as a mountain stream said “Richard, keys” and just walked off in the direction of his room. I was left gobsmacked; it all happened in the blink of an eye and all that went through my head was “how did he know I was looking for the keys to the office”. But sure enough, as large as life, there were the office keys sitting on the worktop; my initial scan having somehow missed them. To me people like Paul, indeed all human beings, are works of art, because you can never know their intricacy just by looking at the surface. I have felt for many years that people with learning disabilities are not simply living out their karma. But in many cases I believe them to be highly evolved souls who incarnate into this realm of opposites in an effort to try to educate us and remove our ignorance. Of course, I am not saying that everyone with learning disabilities is a highly evolved soul, but who am I to judge. Regardless, they are all wonderful teachers, because we cannot but have our lives changed in some way by interacting with them; and as we change we also evolve, and as we evolve so does our perspective of the great canvas of life. 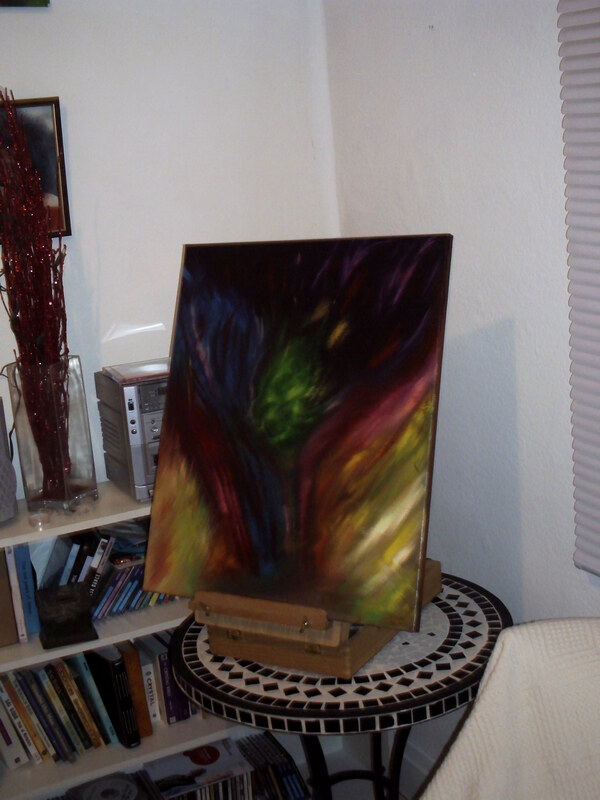 This entry was posted in From The Heart and tagged Art, highly evolved souls, karma, learning disabilities, oil painting by Bloggin With Rich. Bookmark the permalink. Good work Richard, way to Live!